What happened to the 50s women who use to slap men? I loved that generation of women and men. The men were men, thus a tad “forward”. And when they crossed the line, the “dames” slapped them. Nowadays, we’ve redefined what things are. If a man accidentally puts his hand too low on the waist of a woman, lawsuits ensue. And that’s if he’s lucky. As for the woman, she’d better not slap a man, even if he fondles her. Because she could end up in jail for assault. Check out this story of Joy Villa. Villa’s claim to fame came when she wore the “Trump dress” to the Grammy’s. We broke that story and had over 5,000 people per minute on my site, with 25,000 at any given time. That was the second most we had in the history of my website. But now Villa claims that Corey Lewandowski “assaulted” her. The songstress who says former Trump campaign manager Corey Lewandowski painfully slapped her rear at a party has filed a complaint against him with Washington, D.C. police—and says his behavior shows he’s unfit to be around the president. 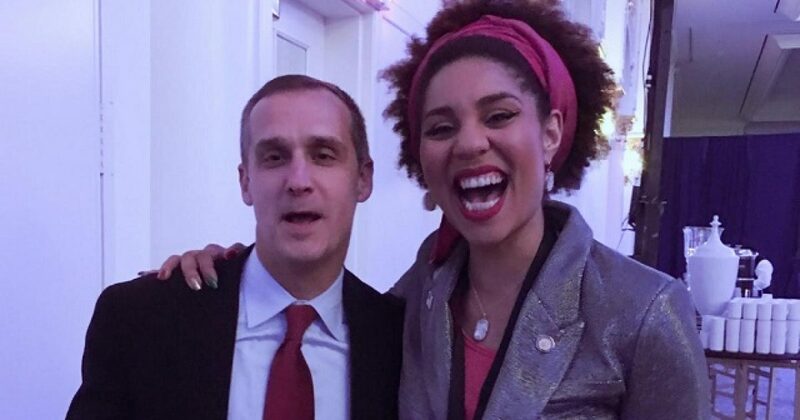 Singer Joy Villa told Newsweek on Tuesday she contacted police this week having never received a word of apology from Lewandowski after he smacked her rear end twice at a late-November party. The Metropolitan Police Department confirmed it has opened a case. Villa said it need not have come to this if Lewandowski had behaved better—before and after the alleged assault. “As it stands, I will be pressing charges. I will be continuing with this investigation, because it’s a criminal offense,” Villa added. Interesting developments under the circumstances. I’m just saying given the many situations of sexual misconduct swirling, Lewandowski would be crazy to have done this, even in jest. But it’s certainly possible. Corey Lewandowski just dropped a book, and I’m sure he got a big advance. Maybe he felt the need to share the wealth? And what of Villa’s career? I haven’t heard much of anything, except a lot of travel. Let’s face it, the publicity of something like this does them both good, all things considered. Villa and Lewandowski were guests at a November 28 party at the Trump International Hotel in Washington, as previously reported by Politico. Villa says after the two posed for a picture together, he whacked her on the rear. You see from Villa’s own picture that both of them had cocktails. It’s impossible to say what’s in either glass, but liquor does lower inhibitions. Certainly both Villa and Lewandowski look to be having fun. I’m not sure why Villa would want a picture with him; no offense. I say this, as she provided the picture to Newsweek, not him. So she obviously asked for the picture. Regardless, I hope these two can mend fences. Further I hope that stories like this begin to wane, as men control their urges, and women start slapping men like they did in the 50s. To me, that’s how things return to normal.